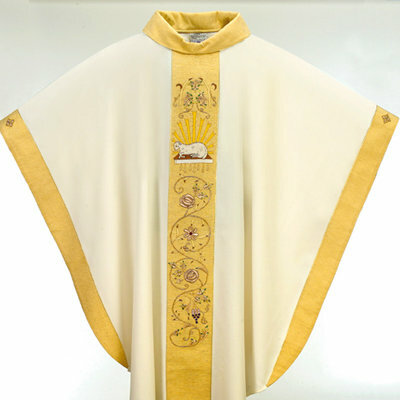 Behold the Lamb of God Chasuble from MDS! This light-weight chasuble eatures a polyester base with Lamb of God motif, hand embroidered on blended Lucerne Silk fabric. It is available in all liturgical colors to accomodate your worship experience. Overall Chasuble Dimensions: 59" wide x 51" long. Materials: Polyester base with Silk-Embroidery. Also available in Poly/Wool blend or 100% Silk. Please call for pricing and details. This fine chasuble is an exclusive design from MDS, made available through Alleluia! Catholic Store.